Shivaay Challenges Anika! Ishqbaaaz 17th July 2016 Written Updates Episode :- Shivaay brings green tea for both brothers. They talk about Omkara’s girlfriend Riddhima. Rudra backbites about Tia. Anika is angry as she lost the contract. She rushes to meet the new trustee of the college. She calls him to stop but she failed to meet him. She got his address and thinks to talk to him. Janvi goes to Omkara, Tej and Janvi recalls the past moments. Janvi says she always want to let him sleep as she never wants to show him the disputes between them. Janvi says Omkara wanted to get married when he was in 4th standard but due to the disputes between them, his childhood got ruined. Tej asks her to live in the present. Tia and Shivaay are talking about delaying of their engagement. She asks to share his problems with her. He recalls Anika, He asks Tia to give him three days. Anika is waiting for the new trustee, Mr. Mukherjee. Omkara and Rudra take selfies, Shivaay reaches there and Rudra again makes fun of Tia. Omkara is worried about his parent’s relation. 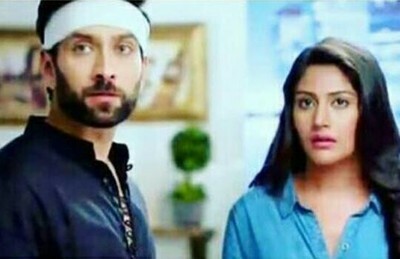 They talked about Anika but Shivaay says he doesn’t want to recall him but he does so each and every moment. Anika is waiting for him for a long ago. Roop goes to Pinky and talks about Tej and Janvi’s relation that it’s the end of their relationship. Pinky says that divorce is not allowed in our family. Roop says their divorce will affect her too. She talks about the Heir of the property after divorce. She counts the benefits of Janvi and Tej’s relation. She offers her to be with her to ruin their relation. As Anika enters Shivaay splashes water on her face. Anika returns the money that Bua picked while he throws the money. Shivaay says the honesty award goes to Anika and asks her surname. Anika replies she is bound else she can also speak up. He challenges that he will break her attitude within three days and then he will show her place to her.